Dr. Meyer explains the truth in the UK Telegraph. In 2004, the distinguished philosopher Antony Flew of the University of Reading made worldwide news when he repudiated a lifelong commitment to atheism and affirmed the reality of some kind of a creator. Flew cited evidence of intelligent design in DNA and the arguments of “American [intelligent] design theorists” as important reasons for this shift. […]Contrary to media reports, ID is not a religious-based idea, but an evidence-based scientific theory about life’s origins. According to Darwinian biologists such as Oxford University’s Richard Dawkins, living systems “give the appearance of having been designed for a purpose”. But, for modern Darwinists, that appearance of design is illusory, because the purely undirected process of natural selection acting on random mutations is entirely sufficient to produce the intricate designed-like structures found in living organisms. By contrast, ID holds that there are tell-tale features of living systems and the universe that are best explained by a designing intelligence. 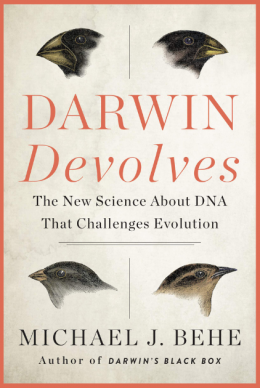 The theory does not challenge the idea of evolution defined as change over time, or even common ancestry, but it disputes Darwin’s idea that the cause of biological change is wholly blind and undirected. […]Consider an even more fundamental argument for design. In 1953, when Watson and Crick elucidated the structure of the DNA molecule, they made a startling discovery. Strings of precisely sequenced chemicals called nucleotides in DNA store and transmit the assembly instructions – the information – in a four-character digital code for building the protein molecules the cell needs to survive. Crick then developed his “sequence hypothesis”, in which the chemical bases in DNA function like letters in a written language or symbols in a computer code. As Dawkins has noted, “the machine code of the genes is uncannily computer-like”. The informational features of the cell at least appear designed. Yet, to date, no theory of undirected chemical evolution has explained the origin of the digital information needed to build the first living cell. Why? There is simply too much information in the cell to be explained by chance alone. The information in DNA (and RNA) has also been shown to defy explanation by forces of chemical necessity. Saying otherwise would be like saying a headline arose as the result of chemical attraction between ink and paper. Clearly, something else is at work. DNA functions like a software program. We know from experience that software comes from programmers. We know that information – whether, say, in hieroglyphics or radio signals – always arises from an intelligent source. As the pioneering information theorist Henry Quastler observed: “Information habitually arises from conscious activity.” So the discovery of digital information in DNA provides strong grounds for inferring that intelligence played a causal role in its origin. Thus, ID is not based on religion, but on scientific discoveries and our experience of cause and effect, the basis of all scientific reasoning about the past. Unlike creationism, ID is an inference from biological data. It might be a good idea now to echo Meyer’s claim with something from the secular magazine Scientific American. As recently as the middle of the 20th century, many scientists thought that the first organisms were made of self-replicating proteins. After Francis Crick and James Watson showed that DNA is the basis for genetic transmission in the 1950s, many researchers began to favor nucleic acids over proteins as the ur-molecules. But there was a major hitch in this scenario. DNA can make neither proteins nor copies of itself without the help of catalytic proteins called enzymes. This fact turned the origin of life into a classic chicken-or-egg puzzle: Which came first, proteins or DNA? RNA, DNA’s helpmate, remains the most popular answer to this conundrum, just as it was when I wrote “In the Beginning…” Certain forms of RNA can act as their own enzymes, snipping themselves in two and splicing themselves back together again. If RNA could act as an enzyme, then it might be able to replicate itself without help from proteins. RNA could serve as gene and catalyst, egg and chicken. The RNA world is so dissatisfying that some frustrated scientists are resorting to much more far out—literally—speculation. The most startling revelation in Overbye’s article is that scientists have resuscitated a proposal once floated by Crick. Dissatisfied with conventional theories of life’s beginning, Crick conjectured that aliens came to Earth in a spaceship and planted the seeds of life here billions of years ago. This notion is called directed panspermia. In less dramatic versions of panspermia, microbes arrived on our planet via asteroids, comets or meteorites, or drifted down like confetti. Naturalists who resort to aliens are still implicating intelligent causes to explain life, ironically enough. Please share and re-tweet this post, because not understanding intelligent design is a mistake that virtually everyone in the mainstream media makes when discussing this topic. I would bet $100 that there is not a single journalist in the mainstream media who can define intelligent design by citing a peer-reviewed article or academic textbook, and then give an example of where proponents of ID think that intelligent design is evident in nature. But also, on that theory, how did life first arise on those aliens’ planet? Would there have to be an infinitely receding line of seeding aliens? I think that they think that the conditions for life on the planet of the aliens would be more hospitable than our own planet. Note, however, that they will likely have any evidence for that belief, since they cannot see the alien planet, nor the process of evolution that led to the aliens. It would all be speculation about unobservable, untestable entities, just like the multiverse. Yeah, it’s bad being an atheist these days. What a mess. You have to check your brain at the door and just believe things that you can’t prove. Nasty!